After scouring my usual haunts in search of this new Strawberry Kiss, I finally found them in Target, where it was cleverly displayed near the registers. I had a hard time keeping myself from tearing the bag open right then and there! I knew patience is a virtue, so I decided to wait to try them after dinner when I knew I could appreciate their flavor to the fullest. The visuals, at least, do not disappoint. Hearts and lace aside, they are really romantic looking Kisses if I’ve ever seen one. Similar to the Hugs and the Candy Cane Kiss, these have the standard white base but are now decorated with brink pink stripes. The smell of strawberry when opening the bag is similar to the dark chocolate strawberry version. Upon tasting the Kisses, I can now say with confidence that they did use the same strawberry flavoring as the Dark Strawberry. I was let down though by how the white chocolate mixed with it. It has a cheese-cakey sort of taste to it, not the sort of sweet creamy vanilla flavor I associate with white chocolate. These Kisses are yummy, but not to the extent that I had imagined. These beauties are worth picking up regardless, especially since they are around only for a limited time. One flavor combo I really love is the combination of strawberry and chocolate. 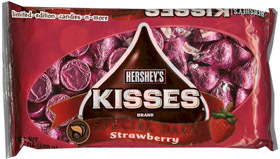 That’s why I was particularly excited to find out that Hershey’s has released strawberry flavored dark chocolate Kisses. I knew they had to be mine. The wrapper is a beautiful berry pink color and the tag proudly announces “strawberry” all over itself. The smell of the Kisses is noticeable right away when the bag is opened, with a very strong, sweet berry aroma. Once unwrapped, I was surprised to see the the shape of the kiss itself suggests it was formed in a mold rather than the press technique that makes kisses so unique. I was confused by this because it’s not of the “filled” Kiss variety, like the Caramel Kisses and Peanut Butter Kisses flavors. The chocolate was dark, shiny, smooth and had a good snap to it. The taste is the same as the smell, having strong candy-like strawberry/fruity flavor. It’s hard for me to describe since it’s different from any other strawberry flavor I’ve tasted before. The dark chocolate is an “aftertaste”, so to speak. It doesn’t really hit you until the wall of strawberry flavor has subsided and the Kiss itself has somewhat melted on your tongue. The texture is nice and smooth with a little grain to it. 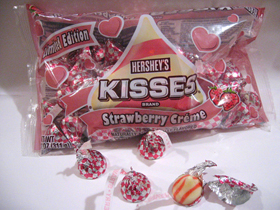 Aside from the strange strawberry flavor and the lack of “chocolatey-ness”, I really enjoyed these Kisses. So much so that over half the bag is gone now and I only bought it a couple of days ago. Oops. This leads me to wonder what the other possibilities that strawberry chocolate could have in the Kisses line. Strawberry and chocolate work so wonderfully together and I can easily see them mixing well with both milk and white chocolate. Why Hershey decided on dark chocolate is a bit perplexing to me. it must be due to the recent popularity of dark chocolate. It seems there is an endless stream of variations of Hershey’s Kisses nowadays, and we can add one more to the list: Candy Cane Kisses. I picked up a mini 1.12 oz package at a Walgreen’s for 49 cents about two weeks ago and promptly forgot about them until now. 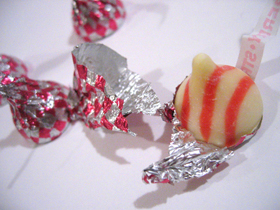 The Candy Cane Kisses are mint-flavored white chocolate Kisses, with “stripes and candy bites”. Unfortunately, these made of the dreaded (to me anyway) white chocolate, so they don’t really appeal to me. They have a slight mint taste to them, and yes, there are tiny crushed up candy cane pieces in the Kisses, but the combo just doesn’t work for me. The hint of mint, and the underlying white chocolate taste are enough to turn me off. The candy cane pieces do add an interesting twist to the usual formula, but they’re nothing special and are clearly intended to just be used as stocking stuffers. I don’t envision people going nuts over these like the Cordial Cherry Kisses. The Candy Cane Kisses are “limited edition”, so if you want to give them a try, act fast. For the Candy Addict in all of us, the United States Post Office has recently unveiled the next design in its “Love” stamp line. Featuring one of the most iconic of American candies, the Hershey’s Kiss, the stamp will be available beginning in January of 2007. The timing of the stamp coincides with the 100th anniversary of Hershey’s Kisses. 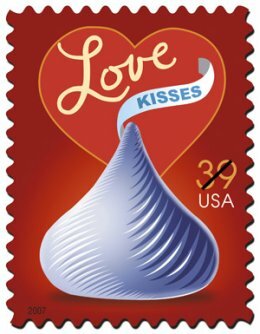 Read more about the stamp and the history of the Hershey’s Kisses chocolate at the United States Postal Service. 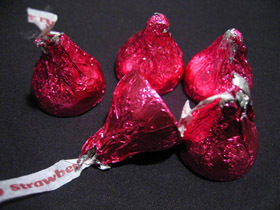 Speaking of the 100th anniversary of the Hershey’s Kiss, Hershey’s will be unveiling some new Kiss flavors to celebrate. Hershey’s Kisses Candy Cane, Kissables Special Dark, and a Cherry Cordial (maybe they decided to make them a full-time product thanks to our petition?) are all coming soon according to this image at Hersheys.com. Hershey’s Cherry Cordial Kisses – Back on Sale! While out on a quest for the new Pirate Pearl White Chocolate M&Ms that were recently released (review to come soon) I went to a few different stores looking for them, and I finally found the M&Ms at my local grocery store. I was excited to find them and my excitement was compounded because right next to them was a huge pile of Limited Edition Hershey’s Cordial Cherry Kisses. The package still says “Limited Edition” on them, but I find it hard to believe that they survived on the shelf since they were discontinued in February, so it’s a pretty safe bet that these are back, but who knows for how long? Perhaps they heard the cries of their fans in the “Make the Cherry Kisses Permanent” petition we started? I found the Cherry Kisses at a Shop-Rite grocery store, and Brian found them at Target. So, fellow Candy Addicts, have you seen Cherry Cordial Creme Kisses where you live? If so, where?